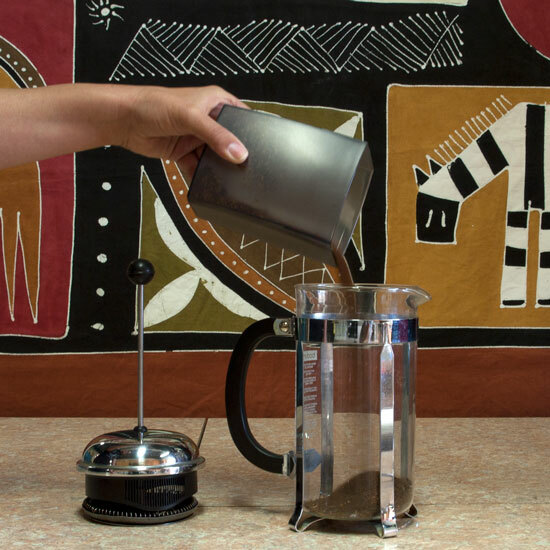 Using a Press Pot, (French Press), is one of the best ways to get an excellent cup at home, on the road or at work. 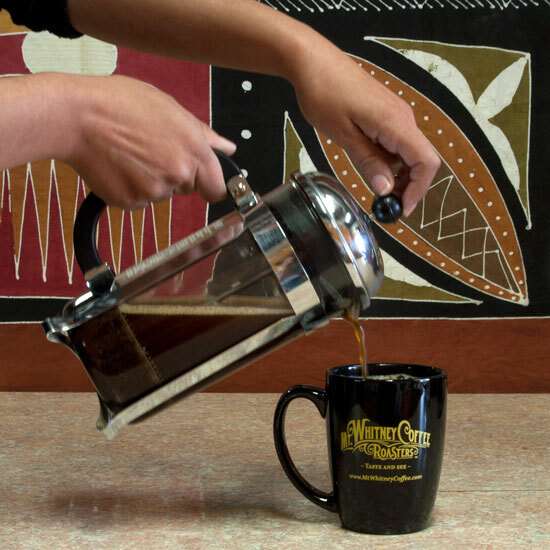 A Press Pot is great because the hot water is poured directly onto the coffee grounds at the correct temperature for ideal extraction so all the flavors of the coffee are released. 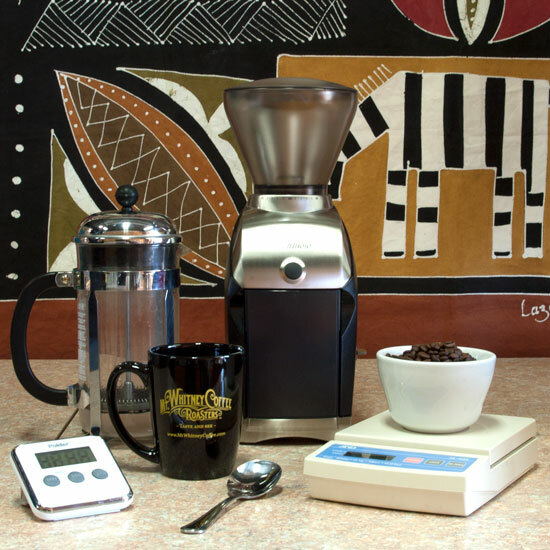 To get good results you will need fresh high quality coffee, quality filtered water, a burr grinder, a spoon, a timer and one or two cups. 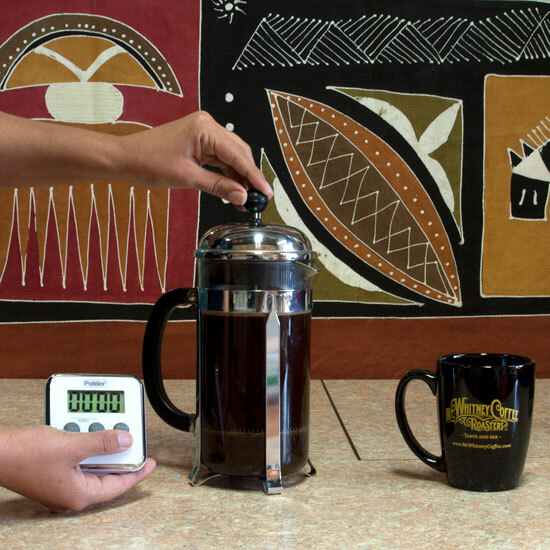 You can also use a thermal carafe if preparing more than two cups. 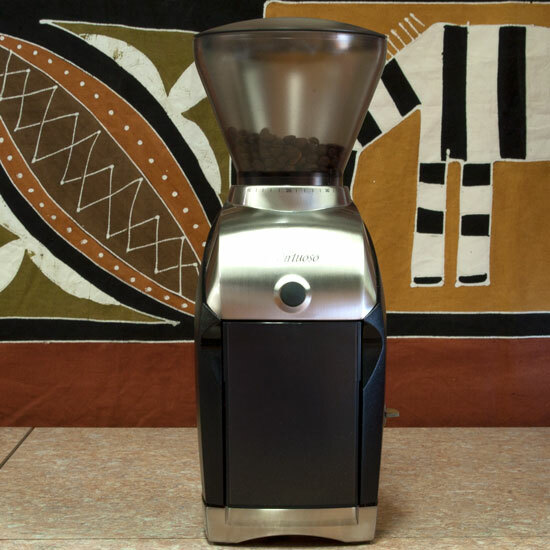 It is important that the coffee be ground coarse with a burr grinder. 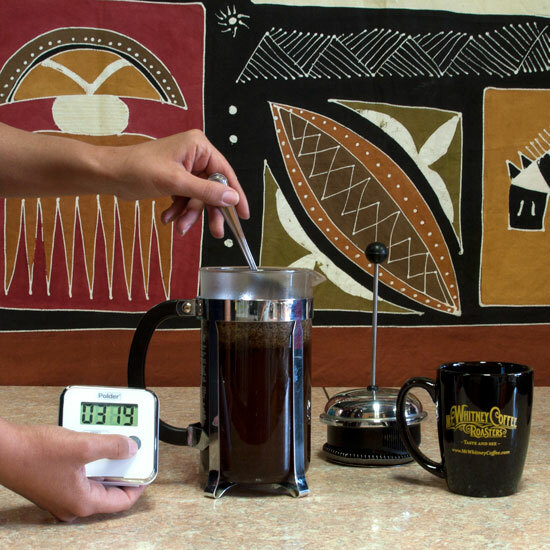 Blade grinders chop coffee into all different size particles that brew differently according to size. Smaller particles will cause bitterness and will flow through the screen on the press causing a cloudy cup. For the Press Pot you want all the particles to be a coarse size and to achieve that you will need a burr grinder set to a coarse setting. Rub the ground coffee between your fingers to feel the grind size. Hold the grounds close to your nose and enjoy the fragrance. This will begin the process of becoming an artisan coffee brewer. You will need two tablespoons, ( 14 grams), of coffee per cup of water, (224 grams). Feel free to adjust this amount based on your own personal taste. 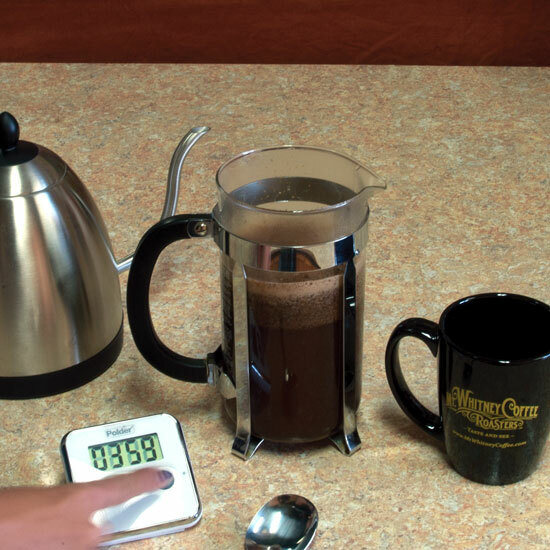 Use a measuring cup to pour water into your Press Pot to see how many cups it holds. If you would like, use a sharpie marker to draw lines on the outside of the glass so you will know how much water to add to your ground coffee. You can also empty your Kettle and add one cup at a time to get a correct amount of water. Bring the water to a boil using an electric kettle or a stove top kettle. Pour it aggressively over the coffee making sure that all the coffee gets wet. Move the stream in a circle and look into the press pot to make sure you are pushing down all the dry grounds with the hot water. Add the water to the correct level, or if you have measured the water into the kettle be sure to pour all the water out of the kettle. You will want to have a timer that counts down from 4 minutes and then rings the alarm. 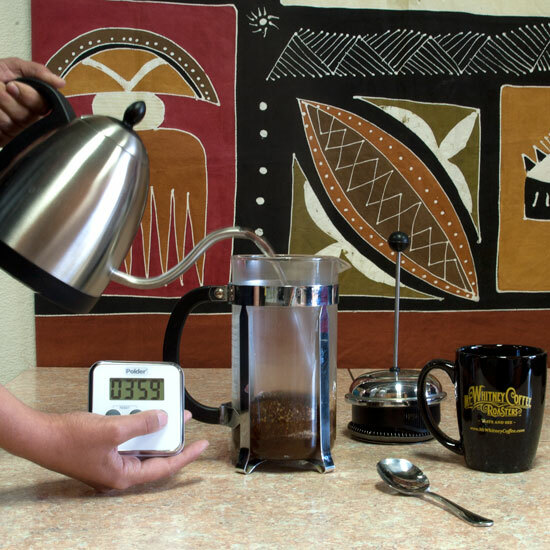 Without the proper brewing time you won't be able to make a good cup, so always time your brewing. Often smart phones have an alarm app. that is quite useful for coffee brewing. Move your nose into the steam and smell the wonderful aroma. What do you smell? Let the aroma enter your mind making a memory for each coffee origin, farm and roast color. After one minute stir the cap into the water gently. This gives you optimal extraction of all the coffee. On freshly roasted coffee released gas can cause a foam that suspends the coffee out of the water. For best brewing the coffee needs to be in the water. Put the top on the press pot to keep in the heat. Make sure you line up the pour slots in front of the spout for proper pouring. At 4 minutes, shut off your alarm and push down the press into the pot slowly. Don't pour all the coffee out of the pot. Leave some in the bottom because down at the bottom there is quite a bit of suspended coffee particles in the water that will cloud a cup. Don't pour out half the pot and leave the remaining for later. The coffee will continue to brew making a bitter over brewed liquid. I like to preheat my cup with hot water so I am pouring hot coffee into a warm cup. That way the coffee stays warm longer, so I can enjoy drinking it over a longer period of time. 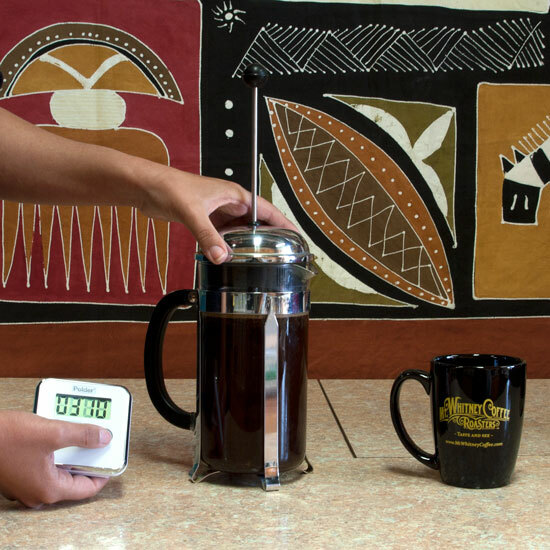 Remember flavor and taste move with the cooling coffee. Some coffees become bitter when cool so drink it while it is hot to warm. Sit back, let the coffee roll over your tongue. What is the flavor? Is the strength ok? Is it fruity and wonderfully acidic or is it bold and intense? Oh the simple things of life.